Wednesday night we once again had kid’s night with a focus on Minecraft at The North Dallas .NET User Group monthly meeting. This blog post is for those who attended so they have some notes on what we covered. If you didn’t come, maybe you will find it useful too. During the meeting we focused on commands and command blocks. Here is what we covered in roughly the same order as Wednesday. For the things that follow, it will be very helpful to know how to get coordinates and to know how to get the names of blocks. While in the game, hit the F3 key (for those with a “function” or “fn” key, you may need to hold that down as well as you hit the F3 key). Your screen should have a bunch of new information on it (you can dismiss this info by hitting F3 again). The first thing you need to know how to find is your coordinates. You should see XYZ: followed by some numbers and slashes. These are your coordinates and mine on are the left. In the screenshot above, my coordinates read XYZ: 146.637 / 66.000000 / –332.009. Anything on the map can be located by a set of coordinates. The first coordinate is the X coordinate, the second the Y coordinate and the third the Z coordinate. In this case my X coordinate is 146 (it is okay to round the numbers), my Y is 66 and my Z is –332. The X and Z coordinates, the first and the third, tell you where the player is horizontally. As a player goes east, his X coordinate increases. As he goes west, his X coordinate decreases. The Z coordinate increases as you go south and decreases as you go north. The middle coordinate, Y, increases as you go higher and decreases as you go lower. Sea level, the level of the oceans in normal maps, is at Y 62. 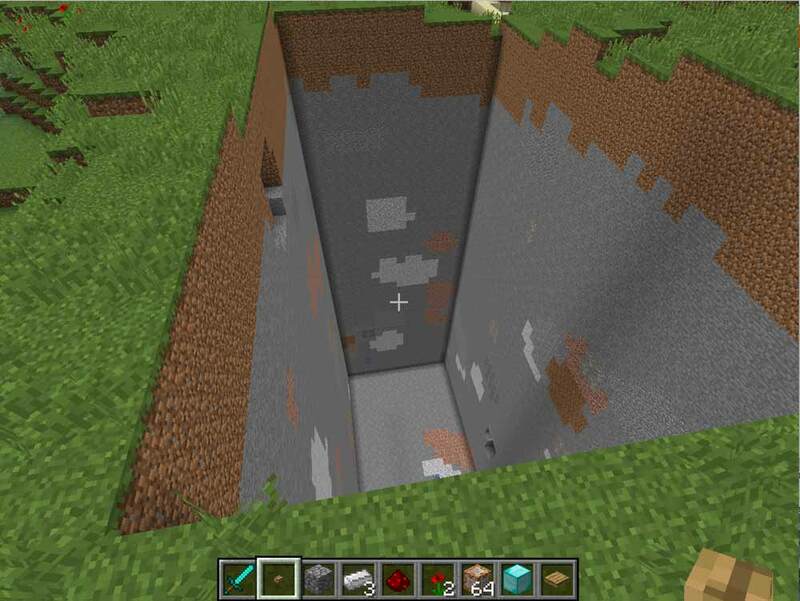 The bottom of the bedrock is at Y 0. So at any given point, you can know exactly where you are by looking at your coordinates and writing them down. Find a village and want to come back some day? Write the coordinates down. It takes a bit of practice but you can learn to follow the coordinates and find your way back. Or you can teleport (see below). Now that we have that covered, we can start with some nifty commands. People who have been playing Minecraft are probably used to typing t to open the chat box so they can chat with their friends. But not everyone knows that you can execute commands there. Let’s start with the give command, which will give you a block. Hit enter. Unless you have all your open slots filled up in your inventory, you should get 64 command blocks. When using the chat window, commands always start with a slash as you see in the example above. Next is the command. In this case, the command is give. After this command comes a number of parameters, or pieces of info that you are giving the command so the command knows what to do. The first piece of info is the player to be given the stuff. If you put a player’s name instead of @p, you will give the command blocks to that player. If you put @p, you give them to yourself. In this case, that’s what we want to do. The next parameter is the name of the block. 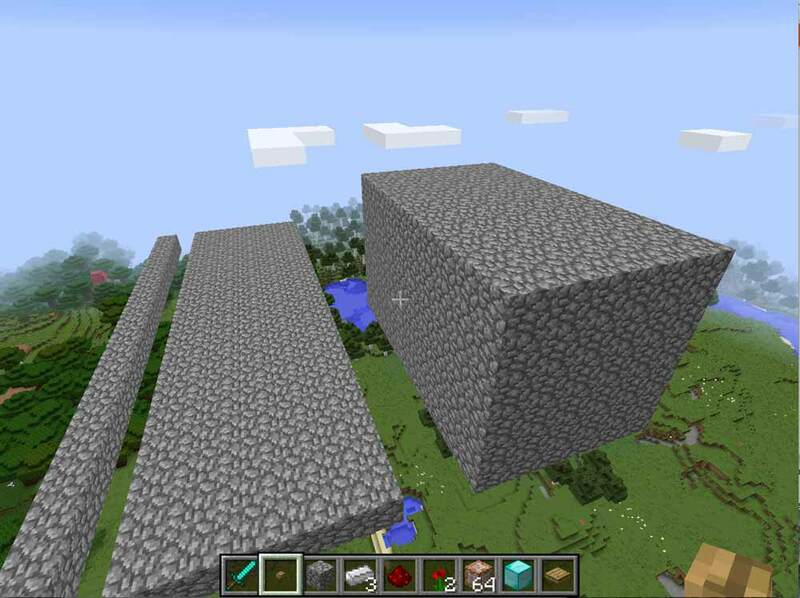 minecraft:command_block is the full name of a command block and you will need all of it to work. The last parameter is the number of blocks go give yourself. Let’s start with 64. Unless you have used command blocks before, you probably haven’t seen them because they don’t show up as items in the creative inventory. That’s why you have to use the give command to get them. 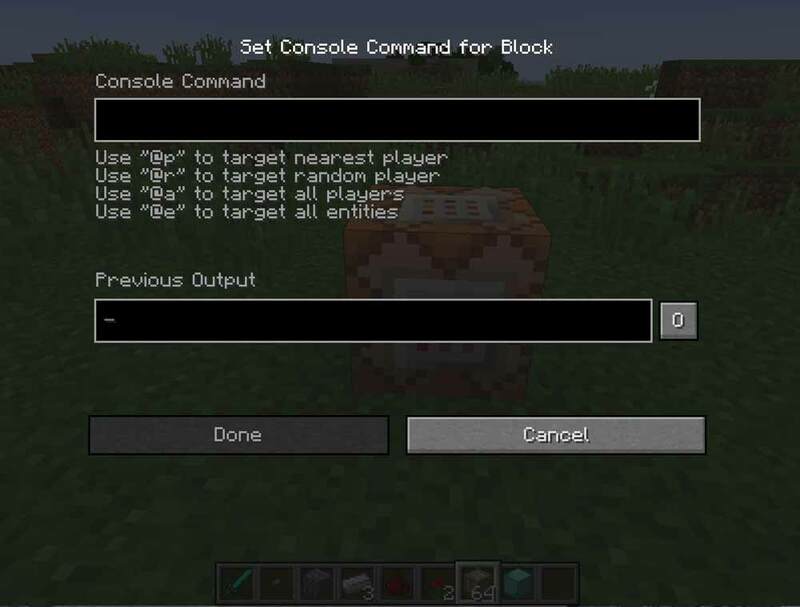 You can use the give command to get any type of block. Here you could use it to give yourself diamond blocks. Now that you have command blocks, we can move on. And then hit the enter key. 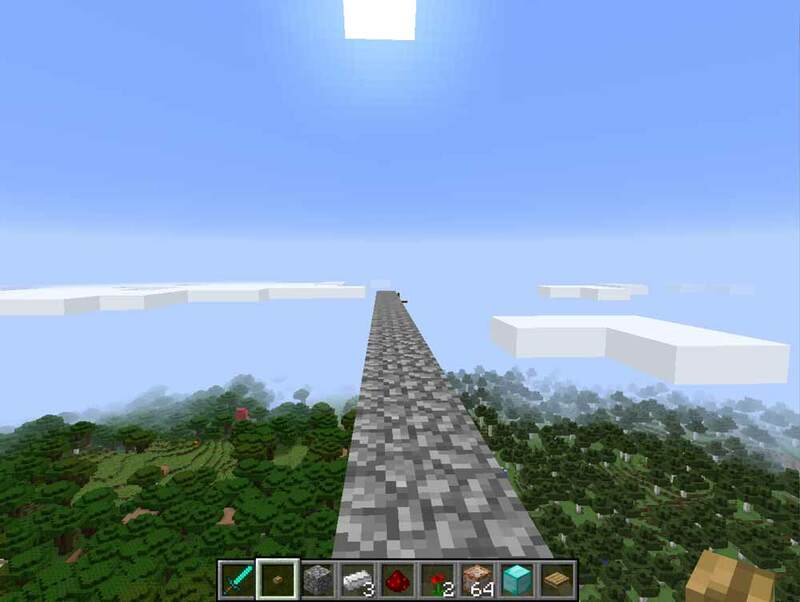 You should teleport to the very center of the map horizontally and 200 blocks up from the bottom of the world (not the ground). Let us take that command apart to understand it. First is the command, much like the give command above. The first parameter is the player to teleport. In this case we want ourselves, so we use @p. Next follows the XYZ coordinates. If you use the ones above, as I said, you’ll teleport to the very center of the map horizontally and 200 blocks up from the bottom. If you are flying, then you’ll likely be suspended in the air. If you aren’t, you’ll start falling. Using the teleport command can be very handy but it can get tedious to type that in every time you want to teleport. Instead of that, we’ll use one of the command blocks we got above. Put the teleport command (without the slash at the beginning) in that top box. Next you need a way to trigger the command block. If you set a pressure plate either on it (hold down shift and then right-click on the top of the block) or right next to it, you can trigger the command by stepping on the plate. There are other ways to trigger command blocks (buttons, redstone, etc.) as well. So what is a good use for this? I most often use the teleport command to make it faster to travel from one part of a map to another (obviously). If you are playing with friends, it is good way to travel to each others houses. If they aren’t close, walking or flying can take to long. Teleport to get there instantly! To do that, write down the coordinates that you want to teleport to at each location and create command blocks to send you back and forth. Note: make sure you don’t put a command block and pressure plate right where someone is teleporting. They may trigger it right when they arrive and teleport back to where they started! This command still uses three coordinates as before. But instead of using the exact coordinates, you use a tilde (that squiggly line). So the above command teleports the current player to the X position he is currently at, the Y position where he is currently at plus 100 more, and the Z position where he is currently at. You can also use negative numbers. That command will send the player to the same X coordinate, a Y coordinate 40 below his current location and the same Z coordinate. You can also change all three. That command will send the player to five X spaces higher than he currently is, 10 Z spaces above where he is and minus five Z spaces relative to where he currently is. Maybe this will be useful for you in teleporting. It can definitely be useful to you when filling. Now it is time to use the fill command. All the commands below will assume that I am facing east. The direction you are facing is specified under the coordinates when you hit F3. 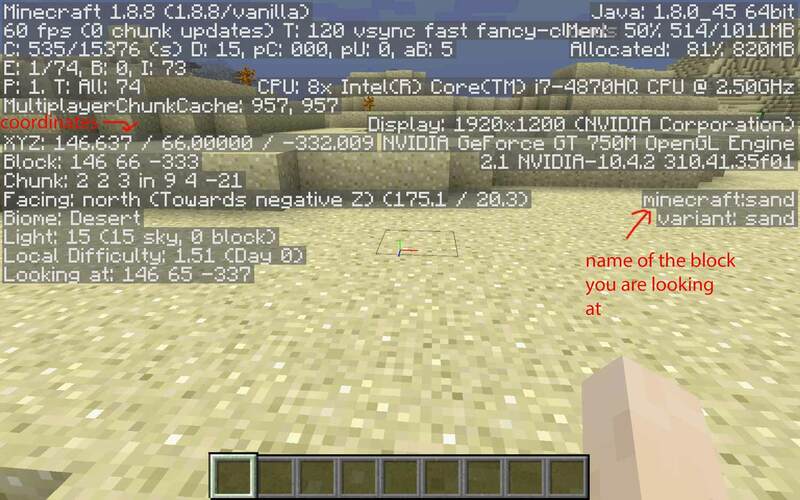 The fill command takes two sets of coordinates, giving you six numbers total and the name of a block. It will fill in the are defined by the changes in coordinates. A few examples will help. If you find this confusing, it might be best to have your parents work with you on the math related to this. Here is our first example. This starts with the fill command. The first three numbers and/or tilde marks are the starting coordinate of the fill. The second set of three numbers and/or tilde marks are the ending coordinates for the fill. As we said above, we are facing east in these examples. As you head east, the X coordinate increases. 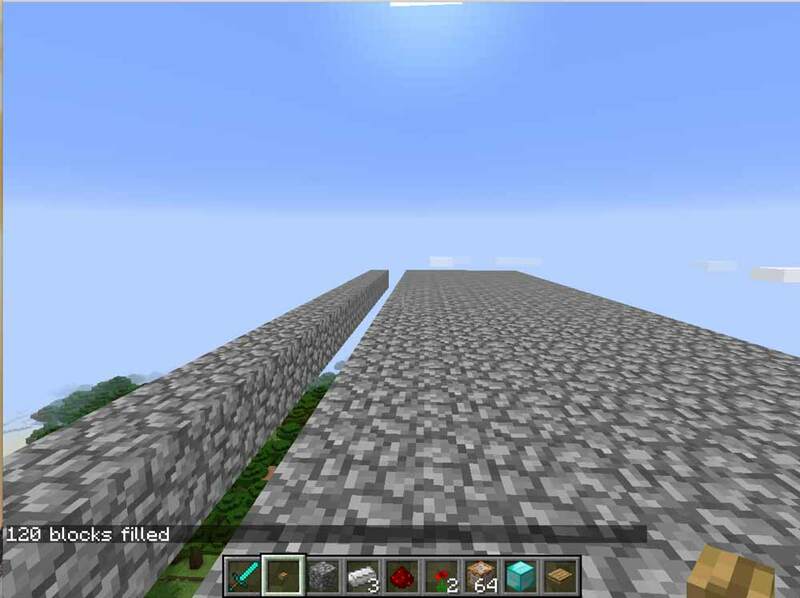 So I am starting the fill one block east of where I am currently (floating in the air in the screenshot below) but at my current Y and Z location. The next set of coordinates is the destination, which is twenty larger X than my current location with the same Y and Z once again. Here’s what it looks like. So if you use the fill command and change only one of the values in the coordinates between the first and second sets, you get a line. Here’s another example. If you change two of the coordinates, you get a rectangle. Since I changed X and Z, I get a horizontal rectangle. To get a vertical rectangle, change the Y instead. So what do you get if you change all three coordinates? Imagine you want to build something in the sky and you need to create a platform for yourself. The second or third fills above would be a great place to start. Or how about you’re on the ground in a flat place and you want a quick wall. This would get you started. Ta-da! This will give you a wall fifty blocks long, five tall and four wide. It’s not four tall and three wide because the relative coordinates include the starting coordinate and then the additions or subtractions, so the second two coordinates ~4 and ~3 get you five high and four thick. Or imagine if you wanted to create a long hallway underground. If you want the resources, dig up the hallway. If you don’t, you can fill the area with air. Another useful idea is to make an iron golem so you can supply your villages with protection. You make an iron golem using iron blocks in the form of a t with a pumpkin on top. You can do that manually…or you can use command blocks! This one is a bit more complicated but may be worth your time (and thanks to Sean Sparkman for helping me with this one). Once again facing east, arrange three command blocks side-by-side. Enter the following commands in each, one per block. 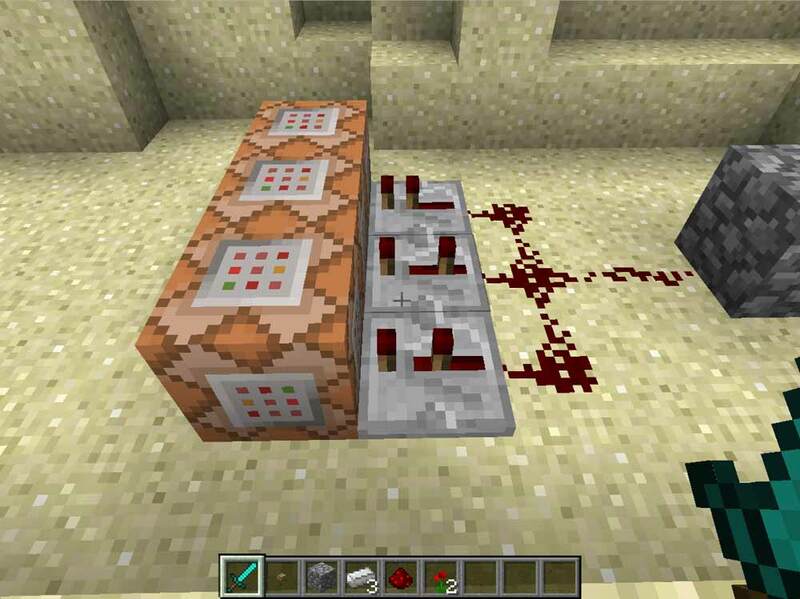 Next place a redstone repeater in front of all three and set the levers in different positions. It should look something like this. 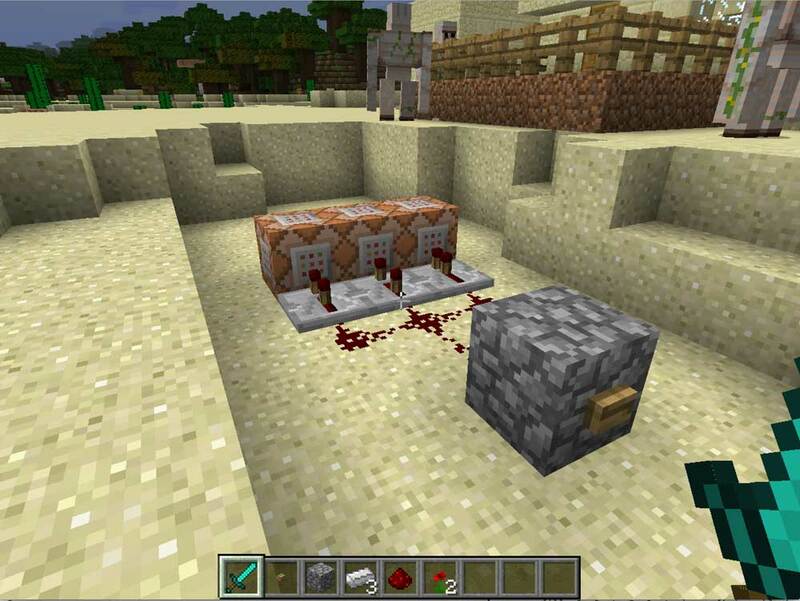 Next tie it together with redstone, lead the redstone to a block and put a button on the block. When you push the button, you should get an iron golem. Make sure there is room in front of the command blocks for the spawned golem. You don’t want them to be spawned inside of a wall or something! And finally, you can use command blocks to spawn entities like skeletons, pigs, cows, etc. Here is how you can spawn a skeleton. For more examples, I would recommend using this web page. I found it very handy. I hope you found it all useful. Happy commanding!